Welcome to today's edition of Nerd Alert, where we have all the quirky, nerdy news that you crave in one convenient spot. What do we have in store for you on this wondrous Wednesday? We have a Breaking Bad-themed coffee shop in Istanbul, a creative father who used a Taken-inspired note to get his kids to do their chores and Cara Delevingne delivers an awkward interview. But first, Ant-Man gets a unique homemade trailer. So, sit back, relax and check out all that today's Nerd Alert has to offer. 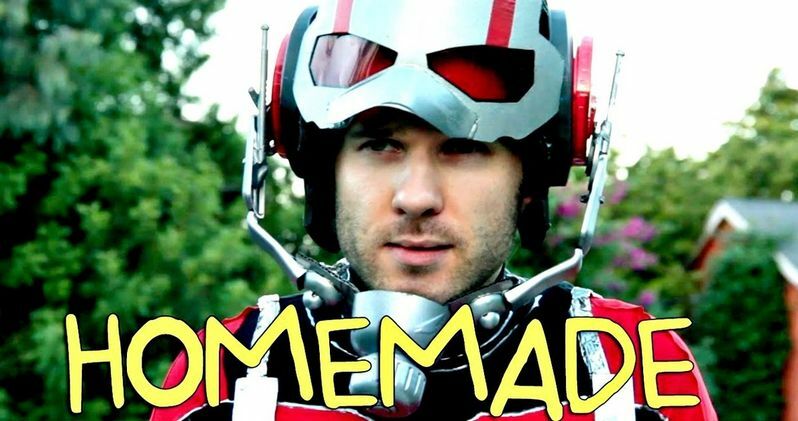 Cinefix's Homemade Movies series has put together an entertaining DIY trailer for the hit superhero movie Ant-Man that is just as charming as it is inventive. Using action figures, homemade costumes and even a beat-boxed version of the trailer song, this video delivers in wonderful ways. We also have another video that features a side-by-side comparison with the actual trailer. Youtuber Dark Antics has posted a satirical video rant about "discrimination" against his fellow bald men, who are commonly portrayed as villains in movies and television. He even created his own version of the Bechdel Test known as the Baldel Test. For a movie to pass this test, two bald characters must have a conversation about a person without hair. If you have 17 minutes to kill, check out this entertaining video. If you're a Breaking Bad fan who ever visits Istanbul, then you should surely check out Walter's Coffee Roastery. Owner Deniz Kosan and his cousin, who resembles Bryan Cranston, brew up coffee in the same style that Walter White and Jesse Pinkman cook up their blue meth in the AMC series, wearing the same yellow hazmat suits and even making blue cupcakes. The owner hopes to expand his shop to the U.S. in the future, so be on the lookout for guys in hazmat suits making coffee. One father used his "particular set of skills" to motivate his children to clean up the kitchen. Shane Labuzan of Carmel, Indiana taped the note you can see above to his kitchen sink, threatening to take away his kids' internet and cell phone access if they didn't clean up the mess in their kitchen. The note was posted to Reddit and went viral, and now, this dad's kitchen has never been cleaner. The dad told Good Morning America that, "98 percent of the time, my kitchen sink is spotless, which it wasn't before the note." Actress Cara Delevingne took part in a satellite media tour to promote her young adult adaptation Paper Towns last week, but her interview with Good Day Sacramento didn't go very smoothly. The interview gets off on the wrong foot right away, when one of the news anchors calls her "Carla," and after a slew of sarcastic responses, the news anchors take her to task for not seeming too interested in the interview. When one of the anchors asks if she's irritated, or it's just them, the actress replies, "No, I think it's just you." This morning, the actress put out this statement on her Twitter page. With Mission: Impossible Rogue Nation hitting theaters this weekend, Cinefix is combing through the entire franchise, with seven unique bits of trivia you may not have known about these action-packed movies. For instance, the first Mission: Impossible, released in 1996, doesn't feature one single gun fight. Obviously that changed in the movies that followed, but for a movie as action-packed as that, you may not have even noticed that no one even fires a gun. Player Piano, which is comprised of filmmaker Tom Grey and musician Sonya Belousova, debuted a new video that any fan of old-school video games should enjoy. Not only does Sonya Belousova perform the theme song to Super Mario Bros. to perfection on the piano, but the piano in question is actually shaped like a Nintendo Entertainment System (NES). There is even a Mario theme in the background while she plays this catchy and memorable tune.